Anker: "Both Officer Negron and Officer Schneider are exemplary role models as they go above and beyond the call of duty." Suffolk County Legislator Sarah Anker honored SCPD Officers Jon-Erik Negron and Michael Schneider. 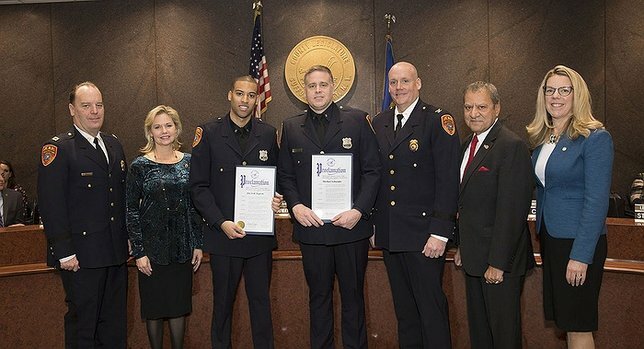 Hauppauge, NY - February 8, 2018 - At the General Legislature Meeting on Tuesday, February 6th, Suffolk County Legislator Sarah Anker, along with Legislators Tom Muratore and Kara Hahn, honored Police Officers Jon-Erik Negron and Michael Schneider of the 6th precinct with proclamations for their dedication to protecting and serving Suffolk County. On December 19th at 3:45 AM, both officers assisted a woman in active labor deliver her baby on the side of Nicolls Road in Centereach. The woman was on her way to Stony Brook Hospital with her husband until birth became eminent. They pulled over and were offered assistance from Officer Negron and Schneider, as well as the Centereach Fire Department Ambulance Company. Subject: LongIsland.com - Your Name sent you Article details of "Legislator Anker Honors Police Officers Jon-Erik Negron and Michael Schneider"